French girl, you wanna make « crazy pirate ramen noodles »? Master says, first you must know classic soba noodles! And learn with a Soba Master of course. Yeah! But soba are from Japan, right? A trip to Japan is completely on my to do list, but not for now. So you can still watch tones of videos of Masters making soba like crazy and try to do the same eh?! But watching them, makes me both impressed and depressed. Have a look, trust me. What’s up with those soba by the way? Soba are particularly interesting because they are made with buckwheat flour (« des Sarrasins Messire », ou simplement de la farine de sarrasin). Buckwheat is not a cereal grain but a fruit seed full of proteins and fibers, antioxydant, etc, synonyme of longevity in Japan. Better known in France with the Galettes bretonnes au sarrasin (crepes from Brittany). It is also gluten free. The gluten is supposed to make the pasta elastic and the original recipe should be 100% buckwheat, so NO gluten in sight. Does that make them super magic noodles however? Not really, some recipes add a small proportion of wheat flour or just find an extra binder (liant). Because my « spent grains – drêches – noodles » have hard time to be elastic for the same reason, it made me more curious about soba. Luckily for me two happy French cousins, Olivier & Bérenger, decided to bring the technique next to my house. 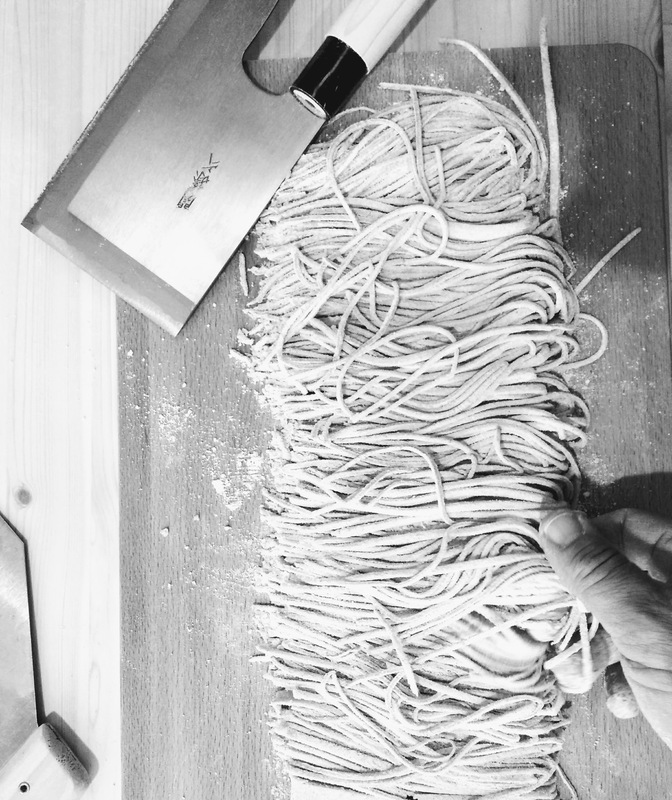 Atelier Soba has just freshly open in Paris (11ème) with a combination of classes and a shop of homemade fresh gluten-free noodles and high quality organic buckwheat flour. Probably much more soon to come because they boil with ideas and good products. So much motivated to find such thing, I was the very first to contact them and to test the classe! During almost 4 hours you knead the flour, shape the dough, cut the noodles in extra fine lines (I dare you), quite a meditating moment with yourself and the holy substance, Namaste. Helped by the nice Master soba Olivier and Bérenger in their joyful workshop, you learn the technique, the story of the products and recipes in a Japanese atmosphere, plus you leave with « tones » of fresh soba made by yourself (and feel proud of it). And finally you share a bowl of soba. Damn it was tasty! Tasty and so elastic with the secret binder ingredient I could not drag out of Olivier, even by threatening them with a huge Japanese knife in my hands. That’s fair I will work harder.